On the morning of January 23rd, 1961, First Lt. Adam Mattocks climbed aboard his B-52G Stratofortress bomber at Seymour Johnson Air Force Base in North Carolina. Mattocks, under the command of Major W. S. Tulloch, was one of three pilots that was assigned to take the plane on a routine training mission that day. What would follow over the next twenty-four hours, however, would be anything but routine. At the end Mattocks would be the survivor of one of the most serious nuclear weapons accidents ever and a large part of the great state of North Carolina would have come unbelievably close to being turned into a smoldering, burned out, radiation-poisoned, death zone. The B-52 was flying that day as part of Operation Coverall, an airborne alert training mission on the Atlantic seaboard involving a large portion of the Strategic Air Command's fleet of nuclear bombers. The mission was designed to practice keeping as many bombers in the air as possible on a continual basis. This was so that during an actual nuclear threat they would not be caught on the ground by a Soviet atomic strike. Because the planes needed to keep flying hour-after-hour without landing, they were being refueled in the air. At just after midnight on the 24th, a KC-135 tanker rendezvoused with Mattock's B-52 to refuel it. This involved a boom being lowered from the rear of the tanker to a receptacle located on the top of the B-52 just to the rear of the cockpit. Before the refueling could start, however, the boom operator noticed a stream of pink liquid spewing from the B-52's right wing: a fuel leak. After hearing this information, SAC headquarters ordered Mattocks' bomber into a holding pattern over the Atlantic Ocean where it would wait until it had lost enough fuel to attempt a safe landing back at base. The leak worsened, however, and it soon became apparent that the Stratofortress needed to land immediately. Under orders, the crew turned the bomber westward with the intention of landing back at Seymour Johnson, located near Goldsboro, North Carolina. The B-52G they were flying that night was the first model of the plane that used integral fuel tanks in the wings. This greatly increased the range of the plane, but put a huge stress on the wing structure. As the plane descended to 10,000 feet approaching the airbase, the right wing gave out completely and the plane broke up in mid-air. The crew tried to bail out. Of the eight men onboard, five survived. Mattock got out by climbing out of the B-52's top hatch and jumping with his parachute. He was the only man ever to pull off that stunt without an ejection seat. The whole incident might have been simply an unfortunate, tragic, but not uncommon training accident if it hadn't been for what the B-52G had been carrying: Two Mark 39 nuclear bombs with a combined yield of around 8 megatons: the equivalent of 8 million tons of TNT that had more power than 500 Hiroshima-type bombs put together. The bombs separated from the remains of the aircraft and plummeted toward the ground landing about 12 miles north of the city of Goldsboro in some farm fields. According to official word at the time, the devices were unarmed and there was never any danger of accidental detonation. In reality, the situation was quite a bit more complicated. One of the bombs simply fell straight down. Given its streamlined casing, it is estimated it hit the ground at nearly 700 miles an hour. The bomb disintegrated, driving itself many yards into the earth. Its tail was found 20 feet below the surface. This sounds terribly dangerous, but the truth is that despite the tremendous shock, none of the conventional explosives designed to trigger the nuclear explosion went off. What happened with the second bomb, however was a lot more scary. 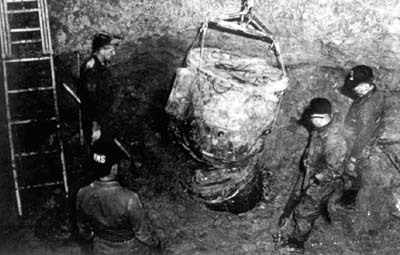 Large thermonuclear bombs, when dropped from an aircraft, require a parachute to retard, or slow, the bomb's fall so that the aircraft has sufficient time to get out of the blast zone. The parachute will not deploy on a fully-unarmed bomb, as in the case of the first Mark 39 mentioned above. On the second bomb, however, the retardation parachute did deploy, indicating that the bomb went through at least part of its arming sequence. 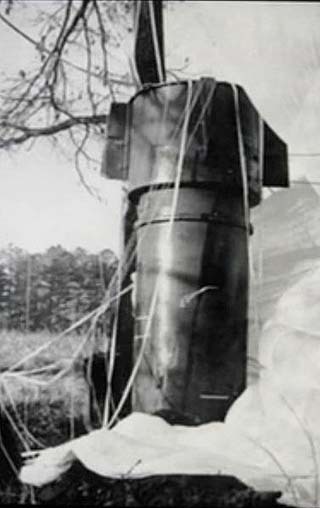 The device's parachute snagged on a tree and this left the bomb hanging with just the bottom 18 inches of the nose buried in the ground. Otherwise it was completely intact. Obviously, since the bomb didn't detonate, it hadn't been completely armed. The fact that the bomb had even partly gone through its arming procedure, however, was alarming to USAF officials and the details of what actually happened inside the nuclear device became a closely-guarded secret. What would have happened to North Carolina if the second bomb had detonated is well-known from extensive tests performed in the Pacific in previous decades. The explosion from a four megaton device would have created a fireball over a mile in diameter. With a temperature of 20 million degrees fahrenheit, everything inside would have been vaporized. Heat and a titanic shock wave would have killed everyone out to a distance of two and a half miles from ground zero within seconds. The small towns of Faro and Eureka would simply have ceased to exist as a blast of pressurized air traveling nearly at the speed of sound flattened even reinforced concrete and steel structures. The heat would have been so intense that even at the outskirts of Goldsboro, seven miles away, the sheet metal on the exterior of vehicles would have melted. The whole of the town of Goldsboro would have been subjected to intense thermal radiation that would have ignited all easily-flammable materials including wood, paper, cloth, leaves, gasoline and heating fuel. As these individual fires merged, an effect called a firestorm would have occurred. Anybody seeking shelter in a basement would most likely been roasted alive by the intense heat or suffocated as the flames consumed all of the oxygen in the air. Anyone within fourteen miles who was exposed to the blast would have sustained third degree burns. It is likely that very few people in the city would have survived. One expert estimated that the bomb was large enough to have a 100% kill zone within seventeen miles of the detonation point, an area that completely enveloped the Goldsboro and its suburbs. By some estimates, 60,000 would have died from the bomb in the vicinity of Goldsboro. Lt. Jack Revelle, the bomb disposal expert responsible for disarming the devices, once said, "As far as I'm concerned, we came damn close to having a Bay of North Carolina. The nuclear explosion would have completely changed the Eastern seaboard if it had gone off." While North Carolina being turned into an arm of the Atlantic Ocean seems a bit of an exaggeration, there is no doubt that the entire United States East coast would have been under threat from the explosion's fallout. What About Those "Nuclear Codes?" A Permissive Action Link (PAL) is a security system designed so that a nuclear warhead cannot be detonated without presidential authorization. The code (usually four digits) is used to prevent renegade military personnel, or terrorists who have stolen a bomb, from detonating it. The warheads are also designed so they cannot be "hotwired" bypassing the PAL. If the bomb is tampered with, it is disabled. For security reasons the methods used to disable it are unknown, but it is speculated that one method is a small charge that can be set off near the bomb's nuclear core damaging it. After that, the bomb could not be used without being rebuilt, though the nuclear material could be salvaged. While a PAL system is not designed to prevent an explosion due to an accident, depending on its design it might create another layer of protection in that scenario. Unfortunately, the MK-39 involved in the Goldsboro incident was designed and built long before PALs were engineered into nuclear warheads and they were not a factor in the accident. Radiation from a nuclear blast comes in two forms. First is the "flash" that comes directly from the bomb when it detonates. Then, in the period after the actual explosion, "fall out" can blanket the surrounding area. 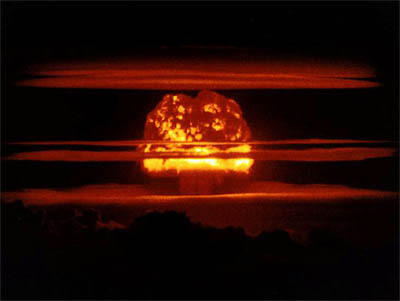 Fall out occurs when the radioactive residue which is propelled up into the atmosphere by the explosion "falls out" of the sky down to earth in the days and weeks following the detonation. These two sources of radiation can be as deadly as the heat and blast effects from the explosion itself. At Hiroshima in World War II it is estimated that over half the people who died weren't killed by the blast effects, but succumbed to radiation sickness in the hours, weeks or months following the dropping of the bomb. Fallout from a blast near Goldsboro could have blanketed much of the East Coast with deadly effects depending on the wind and weather conditions following the detonation. It is estimated that the cloud could have reached as far as Washington, Baltimore, Philadelphia and even New York City. How Close Did It Come To Detonation? Although the basic information of what happened over Goldsboro in 1961 has been known for decades, some of the most important (and scary) details became public only recently. Investigative journalist Eric Schlosser, while researching his book Command and Control, was able to obtain a classified report on the incident under the Freedom of Information Act. The account was written by Parker F Jones for the U.S. government eight years after the incident. Jones, a senior engineer in the Sandia National Laboratories in Albuquerque, N.M, was a leading expert on atomic weapons safety and his department was in charge of the mechanical aspects of nuclear devices. He entitled his work Goldsboro Revisited or: How I learned to Mistrust the H-Bomb (a spoof on Stanley Kubrick's satirical film title Dr. Strangelove or: How I Learned to Stop Worrying and Love the Bomb). Jones found that on the second bomb three of the four safety systems that were designed into it to keep it from detonating accidentally failed. The fourth, a simple, low-voltage switch, was all that stopped Armageddon from happening in North Carolina that day. Parker found that the switch that prevented detonation could have easily been shorted by an electrical jolt, leading to an accidental detonation. "It would have been bad news - in spades," he wrote in his report. When the bomb touched down, a firing signal was sent to the nuclear core of the device, and it was only this single switch that prevented catastrophe. 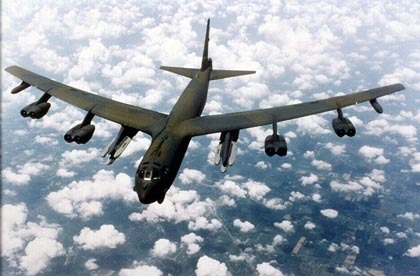 "The MK 39 Mod 2 bomb did not possess adequate safety for the airborne alert role in the B-52," Jones concluded. Perhaps as terrifying as this is what they found when they excavated the first bomb from the hole that it had dug for itself in the farmer's field. The bomb went so far into the ground, and the water table was so high, that some parts of the device were never recovered. The best the Army Corps of Engineers could do was buy an easement from the farmer that forbids digging deeper than five feet. To this day, the North Carolina government continues to test the area for signs of radioactive contamination. One part that was found, however, was the same low-voltage switch that had prevented detonation in the second bomb. ReVelle, who was in charge of the recovery, recalled the moment when the switch was located. "Until my death I will never forget hearing my sergeant say, 'Lieutenant, we found the arm/safe switch.' And I said, 'Great.' He said, 'Not great. It's on arm." ReVelle later remarked on the second bomb, "How close was it to exploding? My opinion is damn close." The same switch that prevented detonation on the second bomb actually failed on the first bomb. Therefore it isn't surprising Jones reached the conclusion on his report that on that day just "one simple, dynamo-technology, low voltage switch stood between the United States and a major catastrophe." Copyright Lee Krystek 2013. All Rights Reserved.